Community Territory War? Community Picks Are In? Really? Really? COMMUNITY picks? Let's be honest. This was a CG concocted idea to destroy the competitiveness of TW and make it fun and playful because Grand Arena is the new zone for competitiveness. Pinning this crap on the community is a nice try, but Capital Games, take credit for this awfulness. Don't shy away from it. But just as we will criticize you when you make asinine game decisions, we will commend you for good ones... The Millennium Falcon finally have Han and Chewy as a pilot and looks like a quality ship! 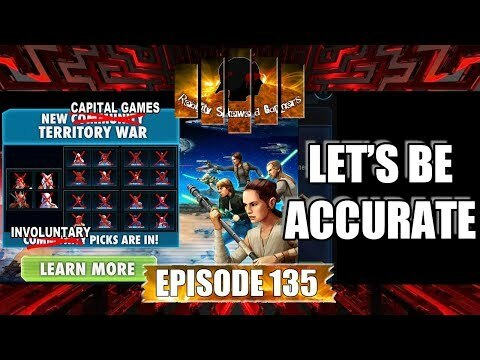 So join us as we talk TW, **** and more on this episode of SWGOH Live Stream!